Gangnam Style's Psy stopped by the UN to teach Secretary-General Ban Ki-Moon some moves. If you've been spending any amount of time on the internet during the past three months, odds are you already know what Gangnam Style is. The incredibly catchy YouTube music video, created by South Korean artist Psy, quickly become a massive international hit that fans have been dancing to the world over. Gangnam Style is now recognized at local radio stations, our very own Escapist Expo, and most surprisingly, the United Nations. Yes, that United Nations, which Psy recently visited to meet (and briefly dance before the cameras) with fellow Korean and UN Secretary-General Ban Ki-Moon. "I'm a bit jealous," Ki-Moon joked with the assembled reporters. "Until two days ago someone told me I am the most famous Korean in the world. Now I have to relinquish. I have no regrets." According to Psy however, the honor of meeting the Secretary-General was entirely his own. "For all the Koreans he is the guy, you know, in everyone's heart in Korea, the best among the best," Psy said. "To be here and he knows me, even the thing that he knows me is so touching right now, and he's saying he saw my video. He counted my video views ... This is much more better feeling than when I did No. 2 on Billboard." The event was a nice change of pace for Ban Ki-Moon, who usually has to deal with far more somber and serious international issues. To the Secretary-General, the meeting was still important as he believes that it's important to engage all aspects of society. 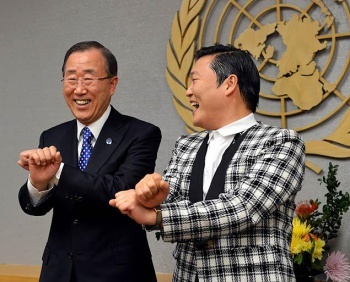 "I think the music can play a very important role," Ki-Moon told Psy. "You have, I think, unlimited global reach." Eventually the two needed to part ways, but not before Ki-Moon offered one suggestion of how Psy could contribute to world peace. "We have tough negotiations in the United Nations," Ki-Moon said. "In such a case I was also thinking of playing Gangnam Style so that everybody would stop and dance, maybe you can bring UN style." Please do, Psy. Please do.